Norwegian director Bard Breien will shoot his second feature The Down’s Detective in the Czech Republic, it was announced yesterday at the Karlovy Vary International Film Festival. The film is a Norwegian-Czech-Danish-German co-production, and it will start shooting in late August. 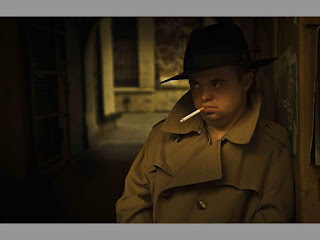 The story is about a man with Down’s syndrome who wants to be a private detective. He has to pursue a former ice-skating legend who is now down on his luck. Svein Andre Hofso, who has Down’s syndrome, will play the lead [he is pictured in character]. Prague will stand in for Oslo in the film. Friland’s production partners are Nimbus (Denmark), Unafilm (Germany) and Evolution Films (Czech Republic). TrustNordisk will handle international sales and Cinemart has Czech rights. The film has received financial support from the Norwegian Film Institute, the Nordic Film and Television Fund, the Danish Film Institute, the Czech State Fund for the Support and Development of Czech Cinema, and Eurimage. “We are truly grateful for the support we have received in the Czech Republic. The Czech State Fund for the Support and Development of Czech Cinema really understands the potential of Bard Breien’s second film. It is a great honour for our company as well as for Czech cinema to be part of such a significant film project”, said Evolution Films’ producer Pavel Berčík. Breiein’s first film The Art of Negative Thinking won the best director prize at KVIFF in 2007. The film went on to win the Czech Lion for best foreign film and then was adapted as a stage production. Bravo to Bard Breien and Svein Andre Hofso for their new movie featuring an actor with Down Syndrome! I am happy to say I am starring in MENSCHEN, an independent short film by Sarah R Lotfi, currently in post-production. Please visit the site to see the trailer and find out more about this great project!